Do ketchup and ranch belong together? America has, apparently, said yes. After 150 years in business, Heinz is truly relishing in its ability to make new condiment creations. Last year, the brand debuted its signature "Mayochup" — a mayonnaise-ketchup condiment that people both loved and hated. In March, the company surprised the world again with “Mayocue” (a mayonnaise and barbecue sauce mashup) and “Mayomust” (a mayo-mustard condiment). But now the ketchup maker is kicking things up a notch with perhaps the kookiest combination yet: “Kranch” sauce. Kranch officially joined the ranks of the Heinz “Saucy Sauce” flavors on Tuesday. According to the brand, the condiment combines ketchup, ranch dressing and a "special blend of spices” in one colorful concoction. “You asked for it. We’ve answered,” Heinz Ketchup posted, alongside a mysterious reveal video. 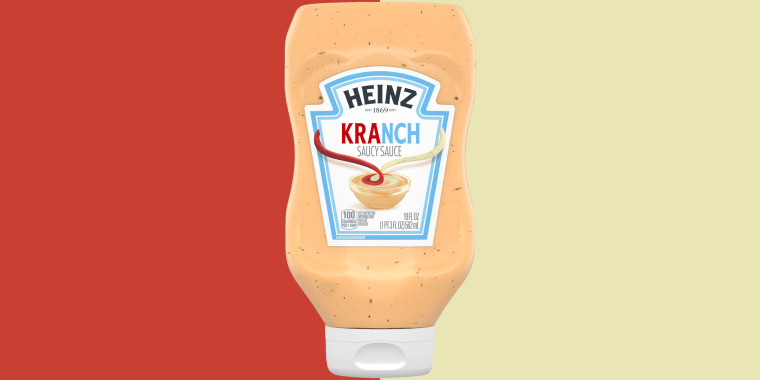 In celebration of Kranch's launch, Heinz announced on Twitter that it would be giving away 100 bottles of the saucy stuff to faithful fans and followers. According to a rep for the company, Twitter users actually inspired its latest flavor mashup. Just like the mayo mixes of Heinz’s past, Kranch sauce is creating some heated conversations online. Tweeters have strong opinions, both in support of and strongly against against the flavor. The unconventional condiment (that you could also just make at home) will hit grocery store shelves this April. Bottles of Mayomust and Mayocue are already hanging out near the ketchup in condiment aisles across the U.S. Each flavor, which comes in a 19-ounce bottle, sells for a suggested retail price of $3.49.